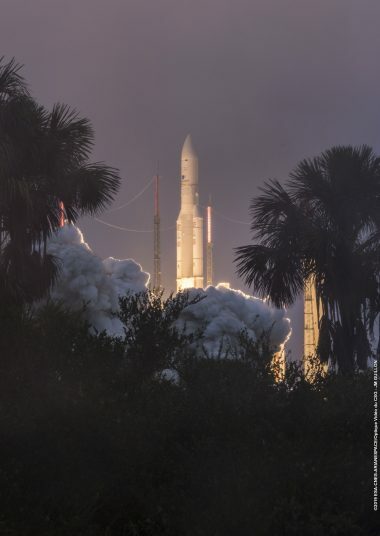 Arianespace’s Ariane 5 is the world reference for heavy-lift launchers, able to carry payloads weighing more than 10 metric tons to geostationary transfer orbit (GTO) and over 20 metric tons into low-Earth orbit (LEO) – with a high degree of accuracy mission after mission. 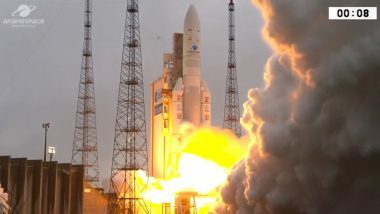 This performance ensures that Ariane 5 will be able to loft the heaviest spacecraft either in production or on the drawing boards, and enables Arianespace to match up most telecommunications satellites for highly efficient dual launches – a capability that has been proven by the company in Ariane-series missions since the 1980s. 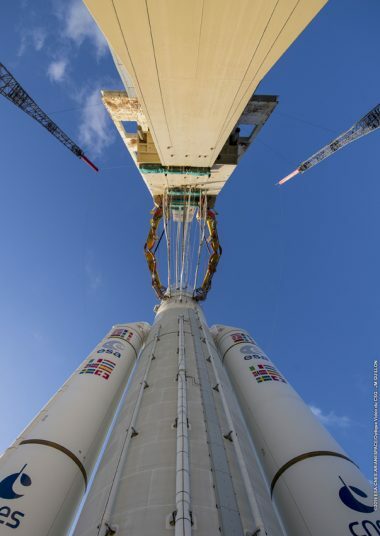 Ariane 5 combines the efforts of a European industrial team with decades of experience in building and operating Ariane launch vehicles. 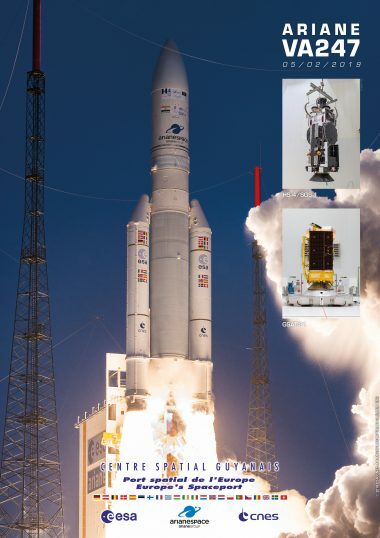 More informations about Ariane 5 specifications only available on desktop and tablet website. 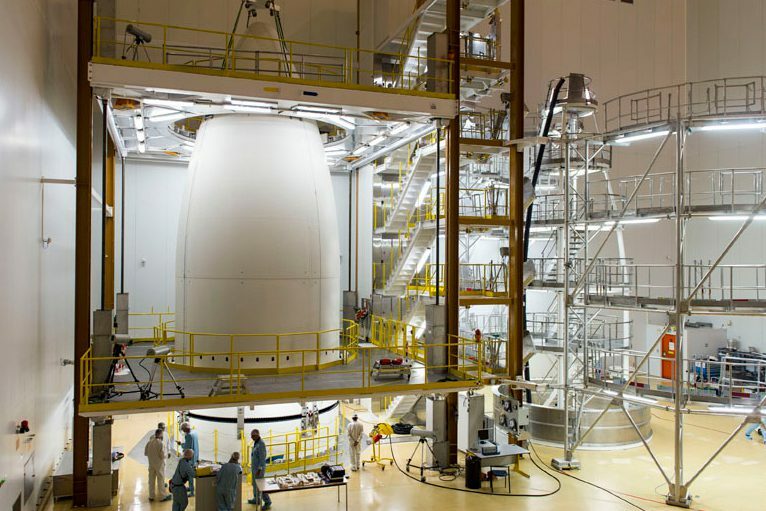 The payload fairing, mounted on the nose of the launch vehicle, protects satellites on the launch pad and during the initial trajectory through the Earth’s atmosphere. 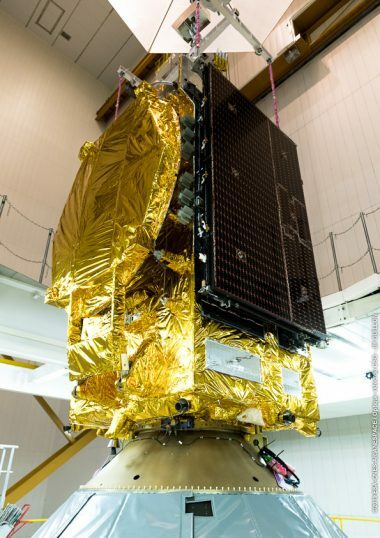 It is produced by RUAG Space, which is the world’s leading supplier of payload fairings made of composite materials. 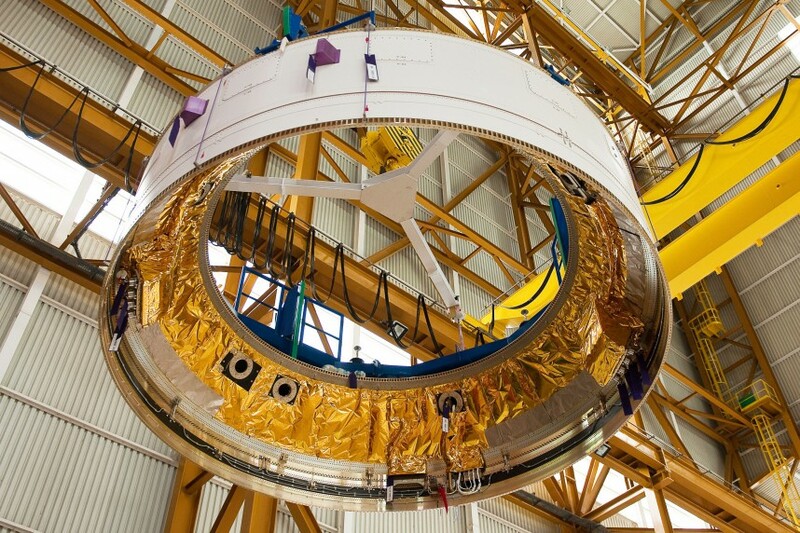 The Ariane 5’s vehicle equipment bay integrates the guidance, stage sequencing, telemetry, tracking and safety systems. Two redundant ring laser gyroscopes are used for inertial reference and guidance during the mission. 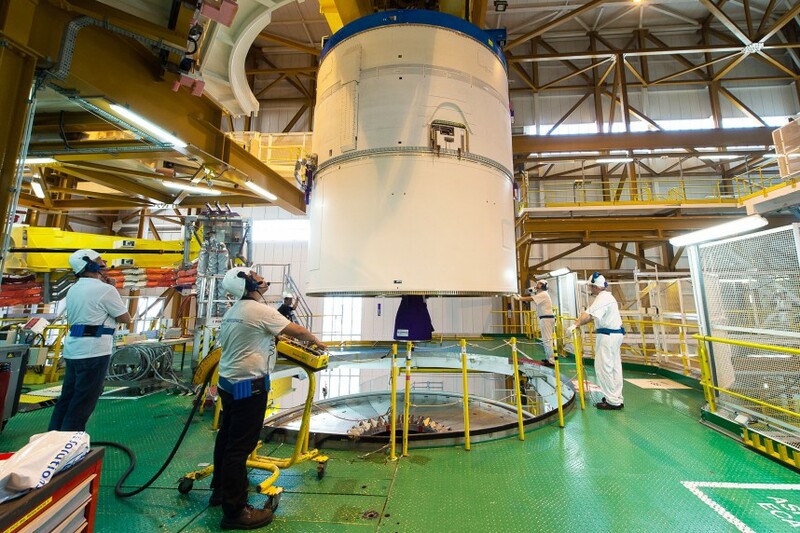 To streamline the assembly process, Ariane 5’s vehicle equipment bay and ESC-A cryogenic upper stage are installed as a single unit atop its cryogenic core stage. 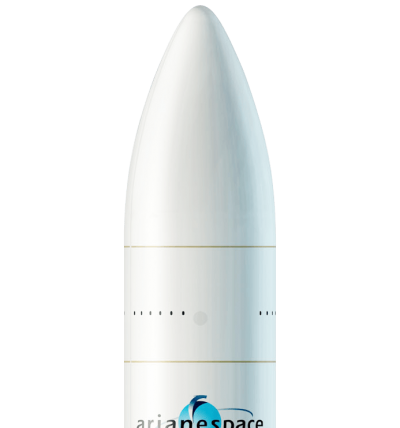 The Ariane 5 ECA launcher version utilizes the ESC-A cryogenic upper stage, which is powered by an HM7B engine. 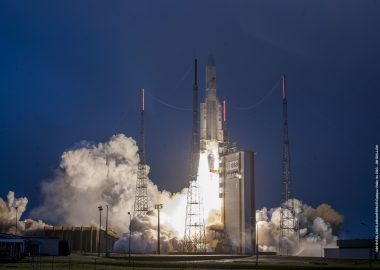 This reliable engine – which also served in the upper stage on Arianespace’s legendary Ariane 4 family of launchers – develops 67 kN maximum thrust in vacuum, and is turbopump-fed and regeneratively cooled. Its thrust chamber is fed by two pumps (liquid hydrogen and liquid oxygen) driven by a gas generator, a common turbine and a gearbox. During the powered flight, the attitude control in pitch and yaw is ensured by gimballing of the engine’s nozzle, while gaseous hydrogen thrusters are used for roll control. During the ballistic phase, roll, pitch and yaw control uses clusters of gaseous hydrogen thrusters, while gaseous oxygen thrusters also are employed for longitudinal boosts. 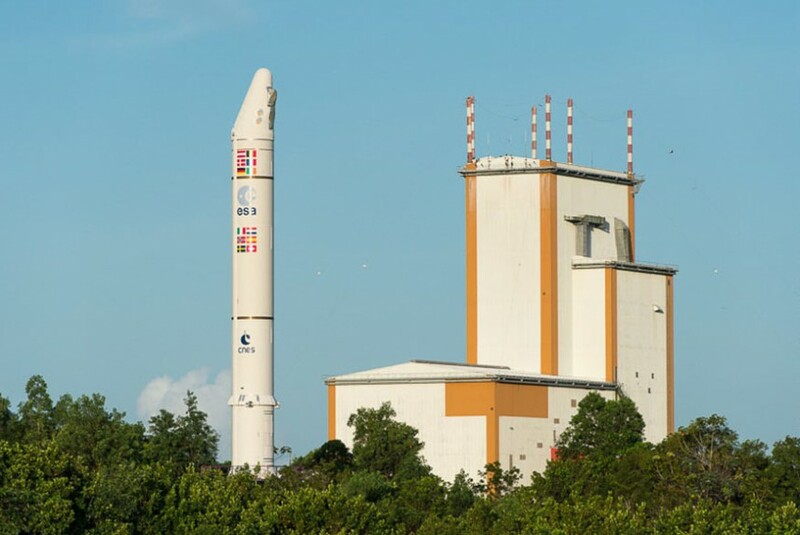 As the central element of Ariane 5, the core cryogenic stage serves as one of the launcher’s key propulsion systems. 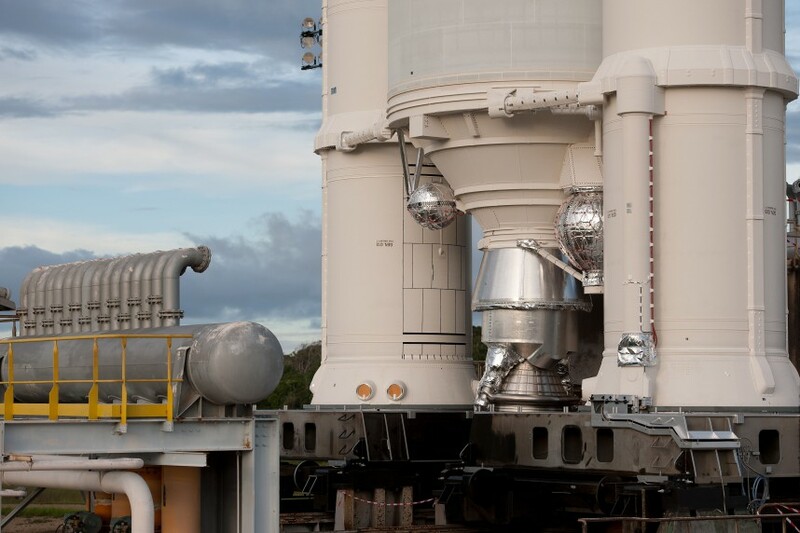 It carries a propellant load of 132.27 metric tons of liquid oxygen and 25.84 metric tons of liquid hydrogen to feed the stage’s Vulcain main engine. The Vulcain burns for just under 600 seconds, providing up to 116 metric tons of thrust in vacuum. 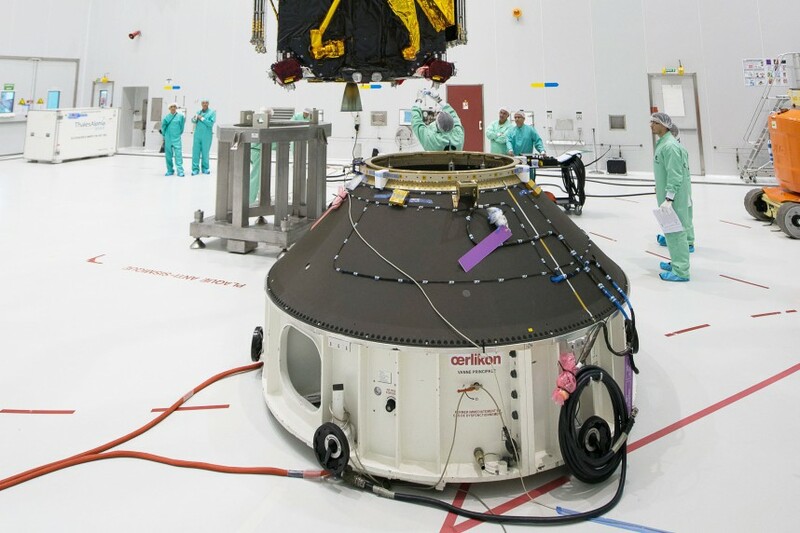 The stage has an overall length of 30.5 meters from the Vulcain main engine’s nozzle to the forward (upper) skirt.Its dry mass is 12.2 metric tons, and the liftoff mass with its load of cryogenic propellant is 170.3 metric tons. 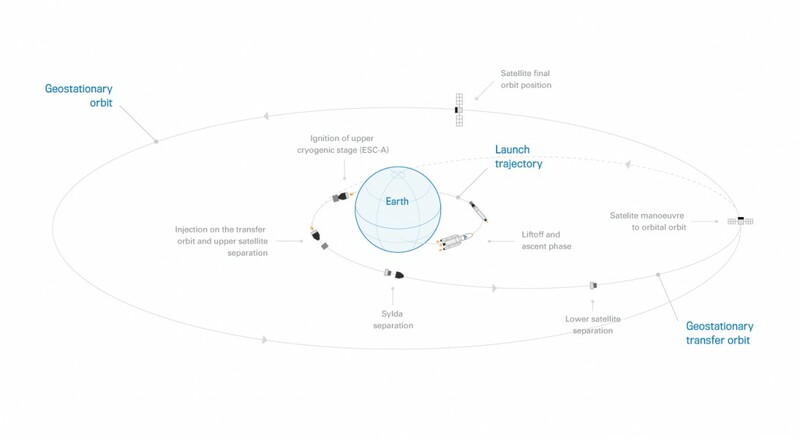 After completing its propulsive mission, the empty stage is commanded to reenter the atmosphere for an ocean splashdown. 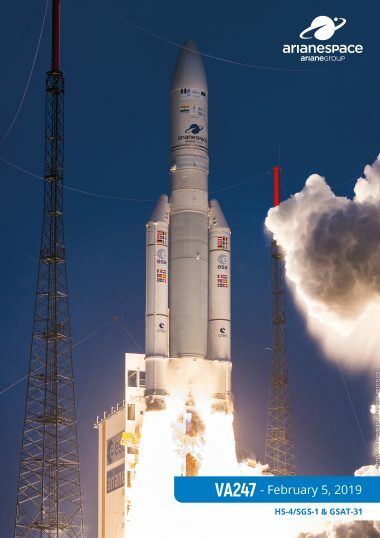 Ariane 5 utilizes two solid boosters, each standing more than 30 meters tall with 237.8 metric tons of propellant. 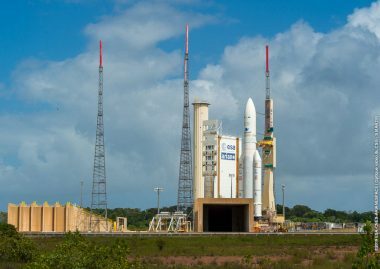 The boosters are ignited on the launch pad once the main cryogenic stage’s Vulcain engine has stabilized its thrust output. They deliver more than 90 percent of the launcher’s total thrust at the start of flight and burn for 130 sec. before they are separated over a designated zone of the Atlantic Ocean. 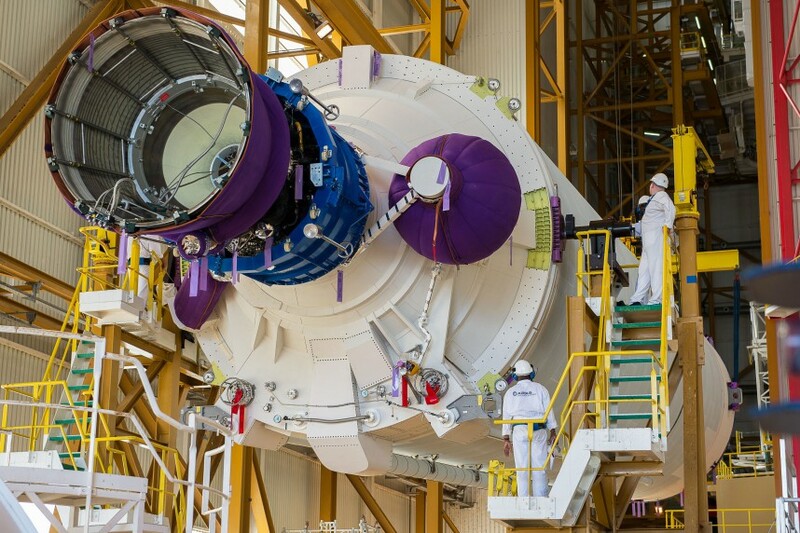 The booster stage’s solid rocket motor is made up of three segments: the 11.1-meter-long aft (lower) segment, which is loaded with 106.7 metric tons of propellant; the center segment, with a length of 10.17 meters and 107.4 metric tons of propellant; and the 3.5-meter-long forward (upper) segment, loaded with 23.4 metric tons of propellant. 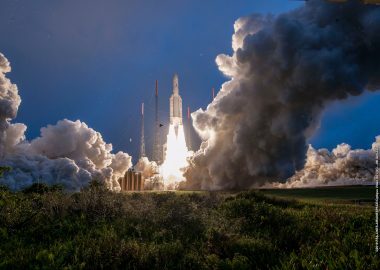 A propellant mix of 68 percent ammonium perchlorate (oxidizer), 18 percent aluminum (fuel), and 14 percent polybutadiene (binder) is used in the solid rocket motors. The combustion process is initiated by a pyrotechnic device, and the solid propellant burns at a radial velocity (from the center outward) of approximately 7.4 mm/sec. 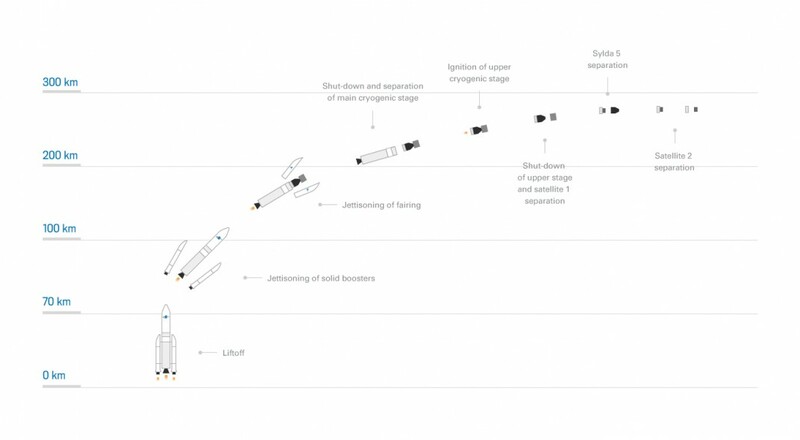 Flight control is provided by the boosters’ movable nozzle, which is driven by hydraulically-controlled servoactuators. The Vulcain 2 engine develops 1,390 kN maximum thrust in vacuum. Its nozzle is gimballed for pitch and yaw control. The engine is turbopump-fed and regeneratively cooled. The thrust chamber is fed by two independent turbopumps using a single gas generator. A cluster of GH2 thrusters is used for roll control.